Latex formula is stronger than solvent-based products. Can also be cut, sawed, planed or drilled. 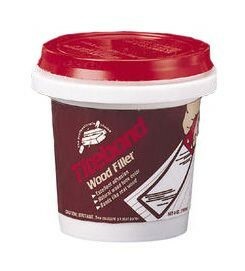 Titebond Wood Filler is ideal for the repair of cracks, holes, chips, and other defects in any type of wood surface. It hardens like wood and effectively holds nails, screws, and tacks. The repaired area can also be cut, sawed, planed, drilled, and sanded easily. 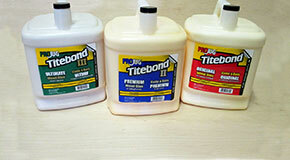 Titebond Wood Filler dries to a neutral color and can be painted, stained, or finished. The latex-based formula is nonflammable, easy to apply, and cleans up with water. It also resists shrinking and cracking (a common problem with lower-quality filler products). Application Temperature: Above 40°F to 100°F for wood filler and substrates. Working Time: Approximately 10 minutes, depending upon temperature and humidity. 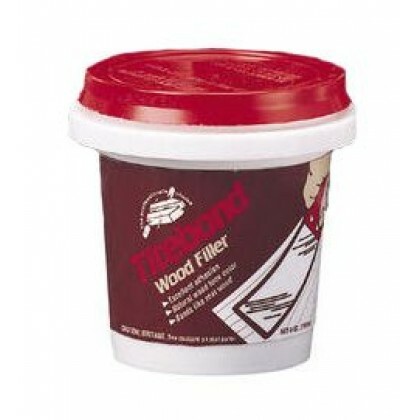 Cleanup: Water when wood filler is still wet. Sand off excess wood filler if dried.